It’s often assumed that a scope has to provide LOTS of magnification. Magnification is important, especially in optics for precise long range shooting but for faster shooting at close to medium range high magnification isn’t necessary and in actual fact could be a hindrance to fast and accurate shooting as it so severely reduces your field of view and exacerbates every slight movement you make to the point that you can even see the movement of your heartbeat in high powered scopes. Lower powered scopes avoid this and are great for tactical applications, close range hunting and for fast furious plinking as well as serious target disciplines such as practical rifle. The advice here will help you choose the best 1-6 power scope for your shooting and will present you with some of the best option on the market today. Low magnification optics come in all shapes and sizes including red dot and reflex sights which offer little or no magnification at all but offer the very smallest and most compact sight options. These style sights also feature illuminated reticles for low light conditions and for the very fastest target acquisition. This style of sight suits fast target shooting, tactical application certain styles of hunting, particularly driven boar shooting. Reflex sights can even be combined with traditional scopes giving a backup aiming system or a sight for use at closer ranges that the standard optic normally allows. Figure 1; a Burris XTR II, which will be featured later in this article, which is also equipped with a fastfire reflex sight for very close range and fast action shooting where the scope might have limitations. Figure 2; An Aimpoint mini H2 red dot sight mounted on a Browning x-bolt for shooting running game, it provides no magnification but a long eye relief for shooting with both eyes open and to facilitate shouldering and accurately firing the gun fast where a traditional scope might require a moment or two to get into a comfortable position with a clear sight picture. Despite all the options for reflex and red dot sights this article will, as the title suggests, focus on traditional telescopic sights. The advantage of this style sight is the light gathering capability they offer making it easier to shoot precisely and see you quarry or targets in lower light conditions, and the option of some magnification, even if it is limited, is useful in aiding precise shooting at mid ranges or for very precise shooting, headshots on small game for example, at close range. These scopes come into their own when used for practical rifle shooting and for some styles of hunting where you may be taking shots at running game. These low powered optics don’t offer the precision required for extreme long range target shooting or sniping but what they sacrifice in precision and field of view they make up for with the speed that they can offer you. For some of the best advice on the web on practicing your speed shooting with a rifle and low magnification optic there is no better teacher than Jerry Miculek, professional shooter and holder of no less than five officially sanctioned world record for revolver shooting and fifteen unofficial records with weapons ranging from pistols to the Barret M107 .50 calibre rifle as well as over 100 national and world titles in various shooting disciplines. One of the first things you will notice even before the advice starts is that he is shooting with low power scopes to achieve the quickest transition from target to target and fastest possible target acquisition. As well as high speed competition shooting low powered scopes have a great practical application for hunting, particularly for running game such as boar. You will see strait away in this video for the shooting show and Swarovski optics that the scope being used has a very small objective lens compared to the kind of scope you might typically use for hunting and that that the stance they adopt as far more dynamic than the position you would adopt in most hunting situation, much closer to the way you might stand while bird hunting with shotguns. This enables you to track and give the necessary lead to your quarry which isn’t always possible with static shooting positions such as from a bipod or with high power scopes. Just as you wouldn’t fit a high magnification scope to your shotgun, if you are going to use an optic at all on a shotgun it will be a simple reflex or red dot, if you want to shoot fast or at running targets with your rifle a low magnification scope is the piece of kit you need. Variable magnification can add more versatility and allow you to use the lower magnification setting for running shots or at close range and the higher magnification for longer distance shots or shots from a rested position if you have time. We’ll cover a range of scope options in this article from fixed low magnification scopes, to variable mags with what I’d class as medium sized objective lenses and one more traditional fixed power scope by Schmidt and Bender that would be an ideal hunting scope. Here are some of the best 1-6 power scopes on the market today. The XTR II range by Burris is an incredible range of scopes designed for tactical applications, this particular model with the 1-5 power variable magnification is the smallest in the range and is equipped with an XTR II ballistic reticle for the 5.56 mm round. This means it is dedicated for use with the 5.56mm cartridge and perfect for 3 gun and other practical rifle disciplines on AR and other similar platforms chambered for 5.56. 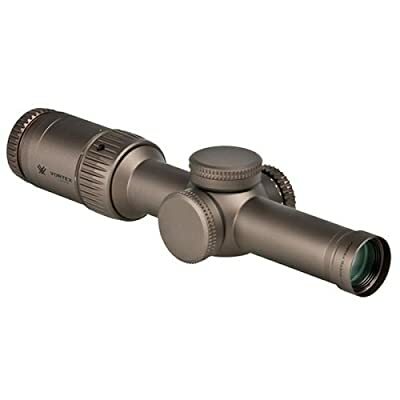 It would also be ideal for military and law enforcement applications and is built to the highest standards to put up with the hardships of active duty and harsh environments and it goes without saying that an optics company of Burris’s pedigree offers a lifetime warranty with this product. The ballistic reticle not only aids shot adjustment at range but the ‘broken circle’ centre aids rapid target acquisition for fast accurate shooting at close to medium ranges, absolutely vital in competition shooting or combat. The bdc reticle does make the target turrets and their finger friendly adjustments a little superfluous as the whole idea of a ballistic reticle is to allow you to adjust your aim with the multiple aim points provided by the reticle rather than having to make adjustments with the turrets. If you are engaging targets beyond the ranges that the reticle normally copes with though the target turrets do allow you to adjust for those longer shots. This scope can be purchased as a package from Burris with mounts and the addition of a fastfire reflex sight for all your combat or competition shooting needs. Vortex Optics since their beginnings in 2004 have rapidly become one of the most respected optics manufacturers in the United States and make scopes for almost every situation and discipline including several models which fall into the 1-6 power range. This Razor HD model is bursting with features and aimed specifically at the tactical market. Available in a number of different reticle styles depending on your preference each one has an illuminated central point to aid fast target acquisition and the innovative feature which allows you to turn the illumination off between each of the eleven brightness settings. This saves you the time and hassle of tediously cycling through every single setting each time to get to the one you want. You can find the setting you prefer and switch it off and with one click of the rheostat be at the exact setting while still having the flexibility to cycle through the other settings to suit light and background conditions if you really need to. Under the protection of the turret caps are low profile finger adjustable turrets which are fully re-settable to zero for zeroing and adjustments. Trijicon is a big name in tactical optics and are best known for their ACOG range of sights for combat rifles but they also offer this more traditional scope. Trijicon have been around since 1981 and are world renowned for their innovative products and particularly their use of tritium and fibre optic technology in their optics. They are official suppliers of the Unites States Government, Marine Corps, Army, SOF as well as state and local law enforcement agencies as well as many other international customers. The AccuPower range of scopes ranges from this compact offering for shooting running game to a massive 5-50x56mm model for serious long range shooting. There are four reticle options for this model from a simple duplex reticle to ballistic reticles packed full of features. The duplex reticle is best suited to hunting while the other reticles are more suited to tactical applications. Whatever reticle suits the shooting you plan on doing they all come with LED illumination to help you find your targets. This offering from Barska is somewhat cheaper than some of the other options presented here and is much closer to what most people might think if when they picture a rifle scope. The 32mm objective lens offers better light gathering characteristics than some of the scopes here with smaller objectives but the fact that, while adequate, Barska lenses and lens coatings are not in the same league as those offered by some other manufacturers so the extra few millimetres of objective lense might not be as significant as it first appears given the higher quality glass on offer in some of the other scopes here. 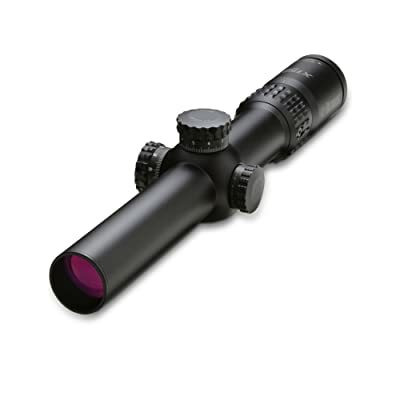 This scope doesn’t offer the super low levels of magnification which some of the other products here do which will make it more suitable for traditional hunting and shooting at static targets rather than super fast practical rifle shooting and for taking on running game but it is a very adequate, relatively low powered scope for simple hunting tasks or moderate range plinking with rim fire or small centre fire calibres. As well as target turrets for easy adjustment it features an illuminated reticle and even comes with the appropriate scope mounts to attach it to your rifle. 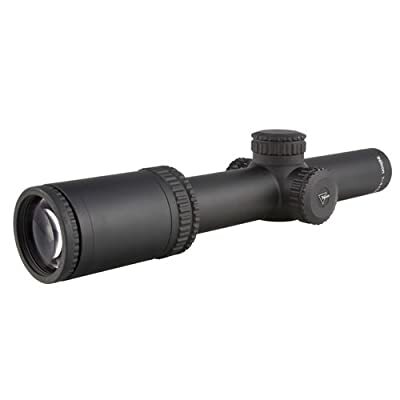 UTG produce some very affordable optics, and this offering gives you a 1-4 power zoom and a 28mm objective in a small, lightweight package that still gives a relatively good field of view in part thanks to it’s robust 30 mm scope tube. The illuminated mill dot reticle and target turrets provide plenty of aiming points and scope for adjustment and the proprietary EZ TAP illuminated reticle gives you 36 color and brightness settings for low light shooting and fast target acquisition something which is important whether you are in combat, on the range or out hunting. Zeiss produce some of the absolute best optics in the world today and have a tremendous pedigree and reputation and while this product is just a tiny glimpse at all the offerings by Zeiss but it is tremendously capable and suitable for all sorts of shooting disciplines. The slim design won’t add any significant weight to your rifle and it is designed specifically for hunting rather than tactical applications. The reticle is suited to hunting rather than featuring a complicated ballistic reticles, the ‘reticle 60’ with it’s fine crosshair and illuminated centre point is perfect for running game and the target turrets. The illuminated point will be visible even in daylight and the finger adjustable turrets provide a useful function for zeroing and range adjustments. Those scopes which feature both target turrets and bdc reticles are a bit over engineered really if you consider that the whole premise of a bdc reticle is to remove the need for constant adjustments, on this scope though the target turrets are justified and will make zeroing and fine adjustments a breeze. A fixed six power scope is my idea of the perfect hunting optic, the fewer adjustments and features the better, it just needs to be robust and accurate. 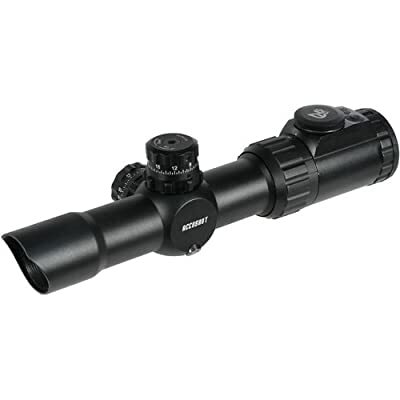 While this scope won’t offer the light weight, fast target acquisition of some of the smaller scopes in this list and is definitely geared towards hunting rather than competition target shooting or tactical applications it is a fantastic quality product as are all of the Schmidt and Bender products. 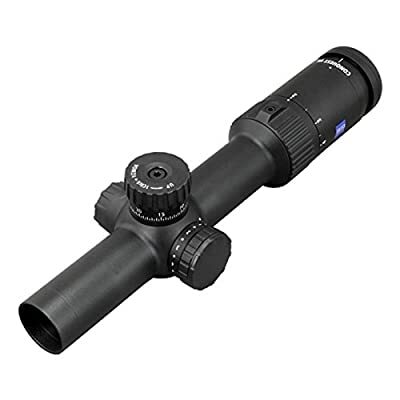 The larger objective lens gathers far more light than the smaller objectives of some of the other scopes in this list and Schmidt and Bender produce some of the best glass and most effective coatings of any manufacturer and you can expect a crystal clear and exceptionally bright image through this scope. All scopes will have lenses and these lenses will always be coated, not only to protect the lenses from scratches, dirt and fog but to improve light transition. These lenses and coating will vary in quality from make to maker but from manufactures like Shmidt and Bender, Zeiss, Leupold and viper will all perform exceptionally. The very best scopes though are all comparable in terms of their coatings and lenses. The variety in the scopes present here makes it difficult to pick one single one as the best but that is the beauty of shooting. There is a disciple for everyone no matter what their budget and equipment to go with it. While lower budgets might demand that the UTG or Barska products be your first choice but they won’t let you down. The Barska, or the Schmidt and Bender if I had the funds, would be my choice for hunting in the traditional sense and the zeiss would be my first choice for driven ground game while the others with their bdc reticles would be better for competition shooting or combat. There is something here for everyone but one this you will not find here is a badly constructed scope. Any of them will give you great performance but the key to excellent performance ultimately isn’t with the scope however good it is, you need to get out there and use it. Putting in plenty of range time is what makes a good shot and that’s what you need to do, decide on what scope you want now but then make sure you don’t waste any time getting out there. A keen traveller Geoff has honed his survival skills in New Zealand and Scandinavia as well as his native Britain. He speaks fluent Swedish after spending several years there and has proven his bushcraft ability on many expeditions. Several of these expeditions were on long distance trails in the UK to raise money for Whizz Kidz a charity that supports disabled children, Geoff has hiked over 2000 miles in aid of this charity.